Aap abhi Mobi Tech Career Hindi blog per mobile phone repairing course online free tutorials or course sikh rahe hai. Ek blackNwhite, colour, camera, multimedia or screen touch mobile phone PCB circuit board per bahut sare small parts lage hote hai. Kisi bhi mobile cell phone PCB per main 2 section hote hai - 1.Network Section or 2. Power Section. Almost all mobile phones ki PCB per sbse uper hamesha network section bana hota hai. Is section me small parts power section ke compare me adhik hote hai. Ek network section all types ke small parts solder huye hote hai. But kuch mobile phone small parts network section me hi lage hote hai jaise network resistance, network capacitor, network crystal. PCB per power section network section ke niche bana hote hai. Isme network section ke compare me small parts kam lage hote hai or yah section network section se bada hota hai. Is section me bhi all types smart parts lage hote hai. Yaha per aap ek baat ko note kar lijiye jahaan per bhi ‘PCB’ word aata hai wo all types mobile phones jaise B/W, colour, multimedia, camera or screen touch ke liye hai. Ab PCB per small parts konse hai unki identification kaise kare, unke kya work hai, kya faults hai etc. ke bare me janange. Mobile phone pcb board per sabse adhik small parts solder huye hote hai. Learning mobile repairing me aapko card level parts ke baad hum mobile phone ke pcb board per small parts ki identification, works or faults ke bare me batayenge. Mobile PCB per main 2 types ke section hote hai: - 1.Network Section, 2. Power Section. Or in two section me all small or big parts lage hote hai. Agar aap small parts ki pahchan krna sikh jate hai to hardware faults ko solve krna bahut aasan ho jata hai. Kyonki kisi bhi type ki mobile phone hardware fault me small part ko bhi check kiya jata hai or small parts per jumper krne se kahin baar fault ka solution mil ho jata hai. PCB Board per In section ke atirikt bhi kahin sare sections hote hai or all section me small parts bhi hote hai. Small parts ko pcb per acche se jaan lete hai to mobile repair krna or bhi aasan ho jata hai. Kyonki kisi bhi cheej ka agar aapko doctor banana hai touske parts ki pachan, works or faults ko check krna aana jaroori hota hai. Hum aapko mobile repair institute jaisa mobile repairing course sikhane ka prayash kar rahe hai. Hum chahate hai ki aap ek acche mobile repair technician bane. All mobile phone small parts electronic components hai or yah smd device hote hai. Mobile phone ke all small parts yani chote parts mobile phone pcb board per solder huye hote hai. Mobile phone ki hardware fault ko fix krne ke liye hum small parts ko digital multimeter se check krte hai. Hum mobile repairing course ko or easy banana me lage hai. 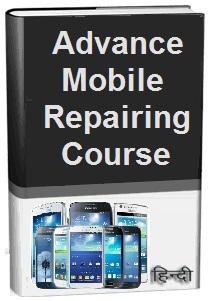 Mobile phone repair course free sikhane ke liye aap humesha kuch na kuch naya sikhne ke liye is website per jaroor aate rahe. Humhari website aapko hindi me mobile repairing sikhane ki koshish me lagi hai. Ab hum apne main topic per aate hai ki mobile pcb per small parts ki pahchan kaise kare. Mobile phone pcb board per 3 types ke capacitor hote hai. Capacitor types on mobile pcb, pahchan, karya or khrabiya etc. ke bare me janange. Non electrolytic capacitor ko sadharan capacitor or pf bhi kahte hai. Yah mobie phone ke all section me lage hote hai. Yah halke black, yellow or brown colour ke hote hai. Non electrolytic capacitor me positive (+) or Negative (-) nahi hote hai. Non electrolytic capacitor direct current (DC) ko filter krne ka karya karte hai. Mobile phone ko DC current mobile battery se milta hai. Electrolytic capacitor ko pollar capacitor or filter bhi kaha jata hai. Yah mobile phone ke all section me lage ho skte hai. Yah Non electrolytic capacitor se kafi bade hote hai. Yah mobile phone ki pcb per 2 colour ke hote hai – Orange or black color. Or stripe (dhari) brown or white colour ki hoti hai. Electrolytic capacitor me positive (+) or Negative (-) hote hai. Isliye inhe pcb se remove krne se pahle positive (+) stripe kis traf hai dekh le. Electrolytic capacitor current ko filter or store krne ka karya krte hai. Yah mobile phone ke kisi bhi section me lage ho skte hai. Yah 2 se adhik Non electrolytic capacitor se bane hote hai. Baki non electrolytic capacitor ki trah same work krte hai. Mobile phone ke small parts me capacitor ki pahchan aasani se kar skte hai. Chip resistance shine black colour ka hota hai or yah mobile phone peb board ke kuch hi section me lage hote. But kuch mobile phone sets me chip resistance blue or green colour ke bhi hote hai. Yah mobile phone pcb per small electronic component hota hai. Resistance current volt ko kam yani (decrease) krke aage bhej dete hai. Agar resistance faulty hota hai to related connect wale part ko current volt decrease hokar nahi jayega isse parts faulty ho skta hai. Yah pcb board ke kuch hi section me laga hota hai. Yah 2 se adhik chip resistance se bana hota hai. Baki iske karya etc. chip resistance ke same hotehai. Diodes pcb board per 4 types ke hote hai: 1. Rectifier diode, 2. Charging Diode, 3. Photo Diode or 4. LED. But mai yahaan per aaoko charging diode or Rectifier diodes ke bare me batayunga. Charging diode ko zener diode bhi kahte hai, or yah pcb board per charging section me laga hota hai. Yah current ko km (decrease) krke aage parts, icetc, ko passes krta hai. Kyonki mobile phone ko jab hum charger se jodte hai to, kabhi charger me kisi type ki fault aati hai. Charger 7 volt se adhikcurrent dene lag jata hai jisse IC, parts etc. Overheat hone lagte hai. Yadi Charging laga honga to wo current ko regulate kr deta hai. But Charging diode ki fix capacity hoti hai jaise 4V, 6V or 8V etc. Charging Diode ki pcb board per pahchan krna bahut hi aasan hai, yah black colour or ek side long leg or other side small leg hoti hai. Isme positive (+) or Negative (-) hote hai. Yadi yah faulty ho jata hai to mobile phone ki battery charging hona band hojayegi. Yah black colour ka hota hai or AC current ko DC current me convert krne ka karya krta hai. Mobile phone pcb board per coils 2 types ki hoti hai: 1. Coil or 2. Boost Coil. Coil mobile phone pcb board ke kahi section me lagi hoti hai. Coil ki pcb board per pahcahan krna bahut hi aasan hai. Coil kahi shape or size ki hoti hai. Yah black or blue colour ki hoti hai jinki side stripe white colour ki hoti hai. Coil current ke voltage ko filter or decrease (kam) krne ke karya krti hai. Boost coil mobile phone ke light section me lagi hoti hai lekin kahi mobile phone sets me yah kahi bhi lagi ho skti hai. Yah black colour ki coli se bahutbadi (big) hoti hai. Yah mobile phone ki display light ki led light ko current passes krne ka karya krti hai. Yah current ko increase krke filter krti hai. Agar yah faulty ho jati hai to mobile phone ki display light glow nahi hogi. Yah black colour ka hota hai or mobile phone ke pcb board per network section me laga hota hai. Coupler ke side me 6 pins bent huyi hoti hai. Yah network ko filter krta hai. Agar coupler faulty ho jata hai mobile phone me network nahi aayega. Yah mobile phone me charging section me laga hota hai. Fuse black colour ka hota hai. Or yah charging ic kea aas-pass laga hota hai. Yah mobile phone me safety ke liye lagaya jata hai. Yah Mobile phone ke pcb board ke kuch section me laga hota hai. Regulator black color ka hota hai or iski 5 se 6 legs hoti hai. Ek side 3 or other side 2 ya 3. Yah current ko filter or regulate krta hai. Transistor mobile phone ke kisi bhi section me laga ho skta hai. Yah black colour or 3 leg ka hota hai. Yah switching ka karya krta hai. 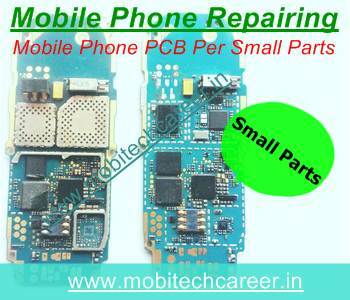 Mobile repairinghindi me aapne sikha ki mobile pcb board per kitne type ske small parts lage hote hai. Note: Yahaa par All mobile phone small parts – coil, boost coil, capacitor, resistance, transistor, fuse, regulate, coupler, diodes etc. ke bare me bataya gaya hai ki vo kya hai or kaise work krte hai or unki kya faults hai. Next mobile repairing course tutorials ki posts me hum un all types small parts ke bare me full detail se janange.